Q: Is a vegan diet for Christians? I wonder why some Christians stop with one verse on the first page of the first chapter of the first book of the Bible when the rest of Scripture has a tremendous amount to say about foods and eating. God himself ate meat and milk while seated before Sarah and Abraham; Jesus as well ate meat and surely fish (it is not likely he cooked fish for His disciples and did not eat it with them.) If it was not healthy, why did He feed it to His closest followers and the multitudes? Proverbs 27:27 instructs the wife to provide goat milk for herself, her family, and servants. Likely Jesus drank this or cow milk. He declared eggs to be a good gift. (Luke 11:12, 13) Today increasingly meat is being raised Biblically as grass-fed by local farmers rather than feed-lot fattened. We have found our Provider to supply what we need to obey Him when we ask Him for it. Gandhi, India's Father of the Nation, was "adamantly opposed to animal-based foods. However, after a lifetime of attempting to successfully eat a vegan diet, the Hindu leader confessed it was not possible to do so and be healthy; and that vegan claims to the contrary were fraudulent." He said, "For my companions I have been a blind guide leading the blind…The scores of India today get neither milk nor ghee nor butter, nor even buttermilk. No wonder that mortality figures are on the increase and there is a lack of energy in the people. It would appear as if man is really unable to sustain life without either meat or milk, and milk products. Anyone who deceives people in this regard or countenances the fraud, is an enemy of India." 1 This from one who hated animal-source food and devoted his life to searching for a satisfactory vegetarian diet, yet never found it. There are two detailed chapters in Eatin' After Eden, well documenting the many—not just a couple—deficiencies of vegetarians and vegans and those diets. A vegan diet/fast can be cleansing and beneficial for a short term once or twice per year. However, I have had a number of long-term vegan clients who had chronic issues they were unable to overcome until they incorporated adequate meat protein into their diets. Some of their testimonies are in Eatin' After Eden. Now the Spirit speaks expressly, that in the latter times some shall depart from the faith, giving heed to seducing spirits and doctrines of devils; 2. Speaking lies in hypocrisy; having their conscience seared with a hot iron; 3. Forbidding to marry and commanding to abstain from meats, which God has created to be received with thanksgiving of them which believe and know the truth. 4. For every creature of God is good [those He created to be eaten], and nothing to be refused [nothing of the clean animals to be eaten], if it be received with thanksgiving: 5. For it is sanctified by the Word of God [Leviticus 11 and Deuteronomy 14, et al] and prayer. 6. If thou put the brethren in remembrance of these things, thou shalt be a good minister of Jesus Christ, nourished up in the words of faith and of good doctrine, whereunto thou hast attained. Timothy was to remind the brethren of this good doctrine to be obeyed. The Creator graciously gave us His good plan for eating in this latter time; if we reject it we do so at our own peril. Are you a vegetarian or do you know someone who is? Be sure and check out the testimony of former vegan GW at this Website! His full-length story appears in Eatin' After Eden, as well as what true science and the Bible say about vegetarianism/veganism. Q: Is the diet taught in your book God's original diet (Gen. 1:29)? No; no one consumes that diet today for several reasons. Further, no one knows exactly which foods available to us today were included in the original diet, only that they grew from non-hybridized seed. We do know that not since perfect Eden has a vegan diet been adequate to sustain humans, or even some animals that are now carnivorous. Far more than plant foods are needed for fallen man, as explained in Eatin' After Eden. This book is all about that "far more" included in Plan B as formulated by our loving, all-wise Creator. Our recommended diet is in principle that diet. Actually there are a number of diets discussed in Eatin' After Eden. First is God's original diet, the Edenic diet Adam and Eve ate. Second is the scriptural diet of the Israelites I follow most closely. Third is what was originally called the 1955 Prudent Diet, a colossal failure, which decried red meat and saturated fat, and which today's conventional diets most resemble. Fourth are vegetarian/vegan diets. which are examined in depth with two chapters devoted to these (fruits and vegetables are important components). God's original diet has not been consumed for thousands of years. Many of the foods in Christian diet books were not part of that though they may be healthy. Even if the perfect foods of the Creator's Dietary Plan A were available, we do not have the flawless, complete digestion and absorption of all nutrients, as did the first humans. Additionally, it is likely their bodies produced all the amino acids required for quality, complete protein as well as vitamin B12 found only in animal-source foods today. Fresh, organic plant foods are components of a healthy diet. Yet after Eden and down through the millennia man has required far more nutrition than is found in these. Because of the Fall and the curse resulting in disease, degenerating genomes, and death, our merciful, gracious Father initiated Dietary Plan B beginning with Noah or before. Additionally, divine love foresaw and provided for our special nutrition needs today. Finally, the Eatin' After Eden diet is not mine. It comes almost entirely from Scripture, line upon line, precept upon precept, here a little, there a little. Adam's descendents of the generations before the Israelites, and the Israelites themselves didn't know the nutrition science behind God's diet. To enable you to make an informed decision, all this has been supplied in one place—interesting, important, detailed information for all the diets. This includes amazing, unique benefits of God's nutrient-rich, animal-source foods, and the benefits and profound deficiencies of the others. Transporting, storage, and spotlighting of fresh, GMO whole foods at room temperatures in supermarkets further decrease the nutrient levels and food values. Foods are irradiated. Commercial processing of foods significantly reduces the remaining nutrients in our foods. Phytochemicals that help prevent degenerative conditions (heart disease, diabetes II, cancer, obesity) are destroyed, and additives are included. Only a small percentage of our livestock are grown scripturally (grass-fed), thus perverting the ratios and amounts of healthy fats, and other nutrients such as protein and minerals. For fifty years the conventional heart-health diet has forbidden red meat, or saturated fat it equates with trans fat. Yet CVD remains the #1 killer disease with nearly one million deaths in 2006. Others demand abstaining from all animal-source foods, regardless of how they are produced. The most critical and highest quality nutrients are therefore dangerously diminished in the Standard American Diet (SAD). Emigrants have been pouring into the US by the multiplied millions for years, bringing with them countless microbes to which Americans have no prior exposure, with weak immune systems to combat the sometimes debilitating even deadly pathogens, leaving internal parasites to "eat your lunch." Even with healthy foods, preparation, and lifestyle, today's chronic stress profoundly interferes with proper digestion and nutrient absorption. The Creator foresaw all this and did not leave His people to fend for themselves. As revealed and explained in Eatin' After Eden - The Meat of the Word, He provided abundantly for that purpose. Yet increasing numbers of Christian leaders have rejected the diet of the Bible. They join secular groups and false religions in teaching vegan diets Scripture refers to as "doctrines of demons" prophesied for and fulfilled in these days in which we live. As a result, we are being taught to avoid the most nutritious foods created by God to be eaten "by those who believe and know the truth." Yet those who consume a godly diet usually thrive. Likewise misinterpreting and twisting such passages as 1 Timothy 4:4 and others, some Christian leaders are teaching and preaching that we may eat anything we like. God's Word tells us His people are destroyed for lack of knowledge, including this crucial knowledge. The fall, the flood, and the final days of the end time are linked. Their components of good health form the Creator's comprehensive plan for eating after Eden. 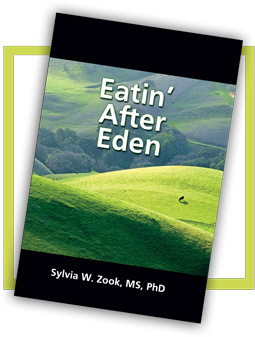 In Eatin' After Eden Sylvia W. Zook, nutrition research scientist and Bible student for more than 40 years, provides this truth as she reveals the Creator's revolutionary health program for our day. She explains scripturally, scientifically, and simply why it is essential to provide suffering saints—sidelined soldiers of the cross—nutritional support for restoration and return to ministry. In plain language this riveting work of fascinating knowledge tells us the vital requirements for continued optimal health for carrying out our callings throughout our allotted days. 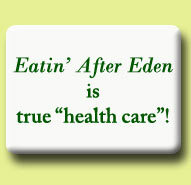 As a balanced work, Eatin' After Eden provides meal plans, Biblical food preparation, and delicious, healthy recipes. More importantly, it supplies simple tips for converting thousands of others that aren't. LEARN HOW TO PREPARE YOUR FOODS HEALTHFULLY AND SCRIPTURALLY WHEN YOU BUY YOUR OWN COPY.